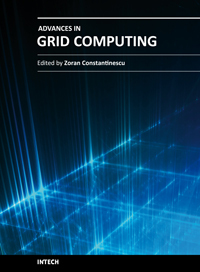 This book approaches the grid computing with a perspective on the latest achievements in the field, providing an insight into the current research trends and advances, and presenting a large range of innovative research papers. The topics covered in this book include resource and data management, grid architectures and development, and grid-enabled applications. New ideas employing heuristic methods from swarm intelligence or genetic algorithm and quantum encryption are considered in order to explain two main aspects of grid computing: resource management and data management. The book addresses also some aspects of grid computing that regard architecture and development, and includes a diverse range of applications for grid computing, including possible human grid computing system, simulation of the fusion reaction, ubiquitous healthcare service provisioning and complex water systems. Zoran Constantinescu got his MSc (1997) at the Department of Computer Science from the Politehnica University of Bucharest, Romania. He has been working since, both in the Software Engineering industry and in Higher Education. He got his doctoral degree in Computer Science (2008) from The Norwegian University of Science and Technology, Trondheim, Norway, with a thesis on a desktop grid computing approach to scientific computing and visualization.